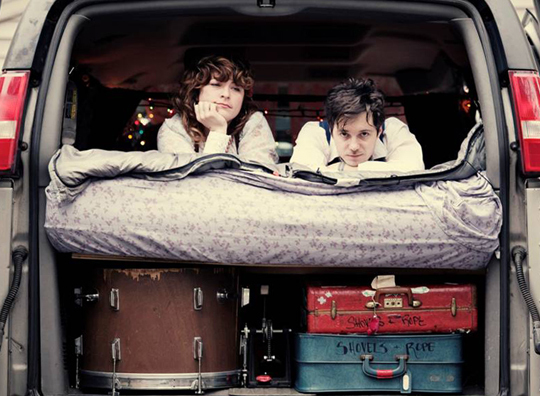 Shovels & Rope and their faithful dog! Shovels & Rope has a new video and we once again get to see who must be their pride and joy, their dog! This video is "Birmingham" which recalls the beginnings of Shovels & Rope (Cary Ann Hearst and Michael Trent). They picked two darling kids to play them in the video and you only get a quick peek at Cary Ann as a bartender. My first experience with Shovels & Rope (and their hilarious dog) was by watching "Gasoline", a video recorded by The Moving Picture Boys. Cary Ann Heart, as my friend Whitney says, "is so adorable it makes me sick" and Michael Trent's ability to play the guitar, bass drum and sing all at the same time amazes me! I can hardly sing and clap my hands without concentrating really hard. As for their pup, well, you will just have to watch the video to see! Are you as in love with their pup as I am? Oh, and what do you think of the videos? I absolutely love them. My fella and I saw them at Rhythm and Roots and then again at a Grimey's in store and can attest= she is completely precious! I love them both!